• The New Orleans Saints continue to be the hottest team in the NFL, having won eight straight games following their dominant performance Sunday in Cincinnati. The Saints made news last week with the signing of WR Dez Bryant but then promptly lost him for the season with an Achilles injury. 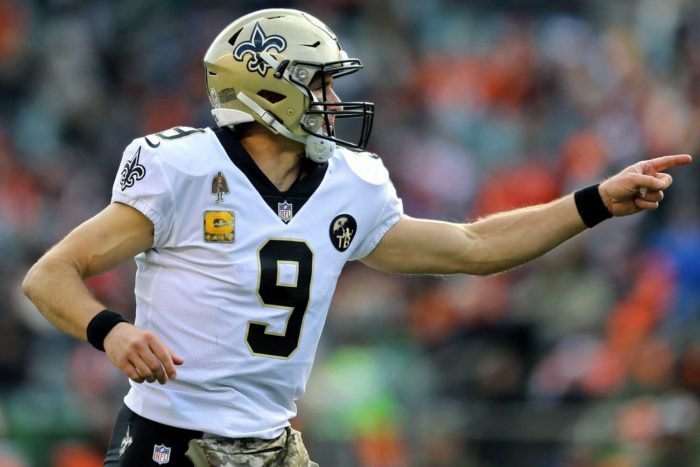 They certainly didn’t miss him in the 51-14 win over the Bengals, as Drew Brees completed passes to seven different players. Among those players, undrafted free agent receivers Austin Carr and Dan Arnold both caught a pair of passes. • The New England Patriots have now lost three games this season, all on the road, following Sunday’s 34-10 loss at Tennessee. In addition to being away from home, the three losses have something else in common: All three came against head coaches who have a familiarity with Bill Belichick’s Patriots. First it was Jacksonville’s Doug Marrone, who spent six years as either an assistant or head coach in the AFC East between 2002 and 2013. Then came Detroit’s Matt Patricia, who was Belichick’s defensive coordinator before being hired this year by the Lions. On Sunday, the Titans had the benefit not only of head coach Mike Vrabel being a longtime Pats linebacker but also defensive coordinator Dean Pees, who was the DC in New England before Patricia. Aside from two more AFC East road games this season, New England must travel to Pittsburgh, where Mike Tomlin’s staff is obviously quite familiar with the Patriots. • The Green Bay Packers, who improved to 4-4-1 with a 31-14 home win over the Miami Dolphins, are starting to look like a more complete team. Rather than relying solely on QB Aaron Rodgers, they got another strong performance from RB Aaron Jones, who had 15 carries for 145 yards and added another 27 yards receiving. And while the defense has not always been dominant, we like what we’ve seen from Mike Pettine in his first season as Green Bay’s defensive coordinator. If the Packers’ defense and running game can be consistently good, it makes Rodgers all the more dangerous. • Don’t be fooled by the fact that Oakland actually won the time of possession battle in the Raiders’ 20-6 loss to the Chargers. Overall, the Raiders had the ball for 31:10. However, it’s understandable that Los Angeles got off to a sluggish start on the road against a 1-7 opponent – and had the ball for only 2:46 in the first quarter. But for the final three quarters, the Chargers had a time advantage of 26:04 to 18:56. • The Saints’ high-octane offense has scored 40 or more points in five straight games. The last team to hold them under 40? Believe it or not, the New York Giants.